TRAVEL is about the journey, not the destination. So they say, but if the journey is about expensive and lengthy transfers, massive queues, invasive body searches, boring lounges, uncomfortable seats, crap food and expensive taxes, then you might disagree. If you can resist the tantalisingly cheap fares of the budget airlines and opt for bus travel, you’ll find that the journey really is as, if not more, important than the destination. Rather than being a means to an end, a bus journey gives you a chance to get to know like-minded travellers, literally watch the world go by out your window, stop at the in-between gems and yes, even drink a beer while you do it. There’s more to the UK than London, innit! With petrol prices at a premium and train travel prohibitively expensive (and confusing! ), in the UK bussing about really does make sense. Enter what is essentially another country as soon as you roll out of London and into the British countryside. AS Caroline Gibson of MacBackpackers says: “The Highlands of Scotland are pretty remote and travellers often underestimate the scale of this beautiful area. “The area is not well-serviced by public transport and you won’t get far without a car, which can be very pricey. 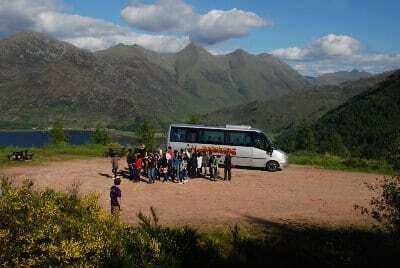 “For backpackers, the most budget friendly and sociable way to visit the Highlands is to join a coach tour. Haggis Adventures cover England, Scotland and Wales with trips starting from London or Edinburgh (www.haggisadventures.com). MacBackpackers specialize in Scotland (and a wee bit of Ireland) from Edinburgh (www.macbackpackers.com) and to explore the oft-neglected Wales look up Dragon Wagon tours (www.dragonwagontours.com) with tours going out of Cardiff. You know that scene in Rules of Attraction where one of the main characters relays his trip to Europe on speed, flitting between London (“Bought some speed from an Italian junkie who was trying to sell me a stolen bike”), Barcelona (“Too many fat American students, too many lame meat markets”), Rome (“Big and hot and dirty; it’s just like L.A. but with ruins”) at a pace that make you travel sick? Well, that could be you. Minus the debauchery, of course. Pack in lots of highlights of Europe in just one trip, cutting out the in-between hassle. As Michael Grierson of Contiki says: “You aren’t wasting time trying to find your hostel in an unfamiliar city, or lugging a backpack around with public transport. Michael also points out that Contiki trips visit unique accommodations such as chateau’s and chalet’s and have exclusive included activities. A classic example is the ‘European Contrasts’ tour which covers 10 countries (11 if you include the Vatican), 14 world heritage sites and a mini break on a Greek island all in one month. The price is from £1959 and travel is from London return. See www.contiki.co.uk. Other 18 to 30 something Europe bus specialists to check out are Topdeck (www.topdeck.travel) who promise to take care of all the boring bits so you can just enjoy the fun parts. One of Topdeck’s most popular options is their European Pathway; a 17 day trip of 8 European countries, staying in a combination of hostels, hotels, bungalows & an Austrian gasthof, from £1095. Topdeck’s ultimate getaway is the Mega European; 20 countries in 49 days, including 3 days sailing in Greece, from £3355. And, by the way, Topdeck love their food. Their gourmet picnic in Paris is legendary. So many festivals, so little time. Whether it’s music, culture or people throwing tomatoes you want to see, there are more and more coach tours to European festivals popping up every year. And the beauty of travelling with a group is that you arrive at the festival with a ready-made group of buddies. As Bomber of PP Travel points out, “The festivities usually begin as soon as you leave London. PP Travel has come up with a doozy this year — a package that combines the famous Spanish Running of the Bulls festival of Pamplona with the wicked Music fest BBK Bilbao. They also run tours to Oktoberfest, La Tomatina and Hogmanay amongst others, See www.pptravel.com. Other party travel festival specialists in include The Fanatics (www.thefanatics.com), who also specialise in sports tours and First Festival Travel (www.firstfestivaltravel.com), who offer all the usual coaching suspects as well as St Paddy’s in Dublin. Topdeck also have a comprehensive range of options for all the big European events. For those that want a bit more flexibility with their coach travel, the ‘hop on hop off’ option is ideal. It means that if you get too drunk, fall in love, or get a travel tip that you want to pursue, you don’t have to worry about missing the coach that leaves at 8am sharp tomorrow. How does it work? Well, Busabout have a range of options from a flexi trip, where you buy a set amount of bus journey’s across the map to be used when you want, to a one-way trip which is a set route of popular and recommended journeys that you can do over whatever timescale you choose. Feel like you’ve exhausted all the beaten paths? Ok, you may have to cheat with a short initial flight, but then it’s on the ground all the way! There are more and more coach options popping up every day — see Busabout’s Eastern Europe routes (www.busabout.com/eastern-europe) or Pillow Travel’s Morocco options (www.pillow.co.uk) for ideas.